It is a known fact that garage doors are often the largest moving part of a typical American home. Therefore, it is important that this door is always in perfect condition, simply because if it stops working properly it can disrupt your daily routine and even potentially cause trouble and physical harm. That's why regularly checking your door's various parts to make sure everything is functioning properly is important. Everything from the springs to the opener must be closely tested and examined. One of the most known methods of garage door maintenance is the simple act of inspection. Looking at the different garage door parts, such as the panels, the springs and the rollers, will give you a basic idea of the current condition of the system, and if it can still function properly or not. It is ideal to check each and every part on a monthly basis, as even a single part is enough to cause problems for the entire door. What's more, when one part breaks, other components are sure to suffer as well, and will quickly follow in its footsteps. Another tried-and-true method for checking your garage door's condition is to perform certain tests to make sure it's able to function safely. There are plenty of tests to perform and each of them is to check a different aspect of the door. However, they are easy to do, require minimal time and effort on your part, and will clearly show how well your door is performing. The most common one is the safety sensors test. You place an object in the door's path and order it to close on that object. If the door refuses to close, or starts to comply but then reveres, the sensors have detected the obstacle and are likely functioning properly. However, if your door tries to close on the object, something's wrong and your sensors must be examined by a professional technician. Spotting any problems that come about during these tests will serve as a clear indicator of the door’s overall condition. Your garage door tracks are susceptible to dust, and will oftentimes start to accumulate residues of dirt and tiny debris. These can create blockages that will impede the door's performance. Therefore, clearing and cleaning the tracks on a regular basis will help your system stay optimized. Make sure not to lubricate the tracks, though. That could actually hinder the door's performance rather than improve it. It is important to stay vigilant at all times regarding these types of potential issues. However, if you find something serious, do not attempt to repair the problem on your own. 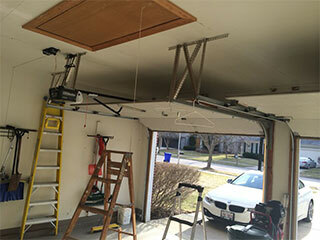 Garage doors can be extremely dangerous and should only be handled by trained professionals. Contact our experts at Garage Door Repair San Mateo for any related need you may have.